Henry Merritt "Hank" Paulson Jr. (born March 28, 1946) is an American banker who served as the 74th Secretary of the Treasury. Prior to his role in the Department of the Treasury, Paulson was the chairman and chief executive officer (CEO) of Goldman Sachs. He is now the chairman of the Paulson Institute, which he founded in 2011 to promote sustainable economic growth and a cleaner environment around the world, with an initial focus on the United States and China. Paulson was born in Palm Beach, Florida, the son of Marianne (née Gallauer) and Henry Merritt Paulson, a wholesale jeweler. He was raised as a Christian Scientist on a farm in Barrington, Illinois. He has Norwegian, German, and English Canadian ancestry. Paulson attained the rank of Eagle Scout in the Boy Scouts of America and is a recipient of the Distinguished Eagle Scout Award. A star athlete at Barrington High School, Paulson was a champion wrestler and stand-out football player, graduating in 1964. Paulson received his B.A. in English from Dartmouth College in 1968; at Dartmouth he was a member of Sigma Alpha Epsilon and he was an All-Ivy, All-East, and honorable mention All-American as an offensive lineman. Paulson received his Master of Business Administration degree from Harvard Business School in 1970. He met his wife, Wendy Judge, a Wellesley College graduate, during his senior year. The couple have two adult children, sports-team owner Henry Merritt Paulson III, more commonly known as Merritt Paulson, and journalist Amanda Paulson, also a graduate of Dartmouth. The Paulsons became grandparents in June 2007. They maintain homes in both Chicago and Barrington Hills (a suburb of Chicago). Paulson joined Goldman Sachs in 1974, working in the firm's Chicago office under James P. Gorter, covering large industrial companies in the Midwest. He became a partner in 1982. From 1983 until 1988, Paulson led the Investment Banking group for the Midwest Region, and became managing partner of the Chicago office in 1988. From 1990 to November 1994, he was co-head of Investment Banking, then Chief Operating Officer from December 1994 to June 1998, eventually succeeding Jon Corzine as chief executive. His compensation package, according to reports, was $37 million in 2005, and $16.4 million projected for 2006. His net worth has been estimated at over $700 million. Paulson has personally built close relations with China during his career. In July 2008, The Daily Telegraph reported "Treasury Secretary Hank Paulson has intimate relations with the Chinese elite, dating from his days at Goldman Sachs when he visited the country more than 70 times." Before becoming Treasury Secretary, he was required to liquidate all of his stock holdings in Goldman Sachs, valued at over $600 million in 2006, in order to comply with conflict-of-interest regulations. Because of a tax provision passed under President George H.W. Bush, Paulson was not subject to capital gains tax. This saved him between $36 and $50 million in taxes. Paulson was nominated on May 30, 2006, by U.S. President George W. Bush to succeed John Snow as the Treasury Secretary. On June 28, 2006, he was confirmed by the United States Senate to serve in the position. Paulson was sworn in at a ceremony held at the Treasury Department on the morning of July 10, 2006. Paulson identified the wide gap between the richest and poorest Americans as an issue on his list of the country's four major long-term economic issues to be addressed, highlighting the issue in one of his first public appearances as Secretary of Treasury. Paulson was known to have persuaded President George W. Bush to allow him to spearhead U.S.-China relations and initiated and led the U.S.-China Strategic Economic Dialogue, a forum and mechanism under which the two countries addressed global areas of immediate and long-term strategic and economic interest. In spring 2007, Paulson warned an audience at the Shanghai Futures Exchange that China needed to free up capital markets to avoid losing potential economic growth, saying: "An open, competitive, and liberalized financial market can effectively allocate scarce resources in a manner that promotes stability and prosperity far better than governmental intervention." In September 2008, in light of the economic crisis experienced by the U.S. in the interim, Chinese leaders evidenced hesitation to follow Paulson's advice. In April 2007, he delivered an upbeat assessment of the economy, saying growth was healthy and the housing market was nearing a turnaround. "All the signs I look at" show "the housing market is at or near the bottom," Paulson said in a speech to a business group in New York. The U.S. economy is "very healthy" and "robust," Paulson said. In August 2007, Secretary Paulson explained that U.S. subprime mortgage fallout remained largely contained due to the strongest global economy in decades. As we work our way through this turbulence, our highest priority is limiting its impact on the real economy. We must maintain stable, orderly and liquid financial markets and our banks must continue to play their vital role of supporting the economy by making credit available to consumers and businesses. And we must of course focus on housing, which precipitated the turmoil in the capital markets, and is today the biggest downside risk to our economy. We must work to limit the impact of the housing downturn on the real economy without impeding the completion of the necessary housing correction. I will address each of these in turn. Regulators and policy makers are vigilant; we are not taking anything for granted. In May 2008, The Wall Street Journal wrote that Paulson said U.S. financial markets are emerging from the credit crunch that many economists believe has pushed the country to the brink of recession. "I do believe that the worst is likely to be behind us," Paulson told the newspaper in an interview. On July 20, 2008, after the failure of Indymac Bank, Paulson reassured the public by saying, "it's a safe banking system, a sound banking system. Our regulators are on top of it. This is a very manageable situation." On August 10, 2008, Secretary Paulson told NBC's Meet the Press that he had no plans to inject any capital into Fannie Mae or Freddie Mac. On September 7, 2008, both Fannie Mae and Freddie Mac went into conservatorship. There is no playbook for responding to turmoil we have never faced. We adjusted our strategy to reflect the facts of a severe market crisis always keeping focused on Congress's goal and our goal – to stabilize the financial system that is integral to the everyday lives of all Americans. We are working through a severe financial crisis caused by many factors, including government inaction and mistaken actions, outdated U.S. and global financial regulatory systems, and by the excessive risk-taking of financial institutions. This combination of factors led to a critical stage this fall when the entire U.S. financial system was at risk. This should never happen again. The United States must lead global financial reform efforts, and we must start by getting our own house in order. But capital markets and the financial services industry have evolved significantly over the past decade. Globalization and financial innovation, such as securitization, have provided benefits to domestic and global economic growth; while highlighting new risks to financial markets. We should and can have a structure that is designed for the world we live in, one that is more flexible, one that can better adapt to change, one that will allow us to more effectively deal with inevitable market disruptions and one that will better protect investors and consumers. The support given by the Federal Reserve Board, under Ben Bernanke, and the US Treasury with Paulson at the helm, in the acquisition of Bear Stearns by J.P. Morgan and the $200bn facility made available to Fannie Mae and Freddie Mac attracted a great deal of criticism in congress by both Republicans and Democrats. Paulson and Geithner made every effort to enable Barclays to acquire Lehman Brothers, including convincing other large Wall Street firms to commit their own funds to support the deal. In light of the recent Bear Stearns criticism, Paulson was against committing public funds towards a bailout, for fear of being labelled 'Mr Bailout'. When British regulators indicated they would not approve the purchase, Lehman went into bankruptcy, and Paulson and Geithner worked to contain the systemic impact. In the aftermath of Lehman's failure and the simultaneous purchase of Merrill Lynch by Bank of America, already fragile credit markets froze, so that companies that had nothing to do with banking but needed financing (e.g. General Electric) could not get daily funding requirements which had the effect of sending the US equity/bond markets into turmoil between September 15, 2008, and September 19, 2008. Paulson, acting as U.S. Treasury Secretary, caused outcries from both the Republican and Democratic Parties as well as the general populace as he tried to get the situation under control. Through unprecedented intervention by the U.S. Treasury, Paulson led government efforts which he said were aimed at avoiding a severe economic slowdown. After the Dow Jones dropped 30% and turmoil ensued in the global markets, Paulson pushed through legislation authorizing the Treasury to use $700 billion to stabilize the financial system. Working with Federal Reserve Chairman Ben Bernanke, he influenced the decision to create a credit facility (bridge loan and warrants) of US$85 billion to American International Group so it would avoid filing bankruptcy, after having been told that AIG held teacher pension plans, 401k plans, $1.5 trillion in life insurance plans for Americans, and the French Finance Minister called to let Paulson know that AIG held the interests of many Eurozone countries. On September 19, 2008, Paulson called for the U.S. government to use hundreds of billions of Treasury dollars to help financial firms clean up nonperforming mortgages threatening the liquidity of those firms. Because of his leadership and public appearances on this issue, the press labeled these measures the "Paulson financial rescue plan" or simply the Paulson Plan. With the passage of H.R. 1424, Paulson became the manager of the United States Emergency Economic Stabilization fund. As Treasury Secretary, he also sat on the newly established Financial Stability Oversight Board that oversaw the Troubled Assets Relief Program. Paulson agreed with Bernanke that the only way to unlock the frozen capital markets was to provide direct injections into financial institutions so investors would have confidence in these institutions. The government would take a non-voting share position, with 5% dividends for the first year on the money lent to the banks and 9% thereafter until the banks stabilized and could repay the government loans. According to the book Too Big To Fail, Paulson, Bernanke, New York Federal Reserve Chairman Timothy Geithner, and FDIC Chairman Sheila Bair attended the meeting on October 13, 2008, at which this plan was presented to the CEOs of nine major banks. Time named Paulson as a runner-up for its 2008 Person of the Year, saying, with reference to the global financial crisis, "if there is a face to this financial debacle, it is now his ..." before concluding that "given the ... realities he faced, there is no obviously better path [he] could have followed". After leaving his role as Treasury Secretary, Paulson spent a year at the Paul H. Nitze School of Advanced International Studies at Johns Hopkins University as a distinguished visiting fellow, and a fellow at the university's Bernard Schwartz Forum on Constructive Capitalism. His memoir, On the Brink: Inside the Race to Stop the Collapse of the Global Financial System, was published by Hachette Book Group on February 1, 2010. In September 2015, Paulson was awarded an honorary doctorate of laws and environmental policy by Washington College President and former FDIC Chair Sheila Bair. In April 2016, he was one of eight former Treasury secretaries who called on the United Kingdom to remain a member of the European Union ahead of the June 2016 Referendum. In June, Paulson announced his support for the stop Trump movement and endorsed Hillary Clinton for the presidency. In his op-ed to The Washington Post Paulson wrote, "The GOP, in putting Trump at the top of the ticket, is endorsing a brand of populism rooted in ignorance, prejudice, fear and isolationism." On June 27, 2011, Paulson announced the formation of the Paulson Institute, a non-partisan, independent “think and do tank” dedicated to fostering a US-China relationship that serves to maintain global order in a rapidly evolving world. Paulson was also named as a senior fellow at the University of Chicago's Harris School of Public Policy. His five-year appointment took effect July 1, 2011. In his best-selling book, On the Brink, Paulson describes his experiences as Treasury Secretary fending off the near-collapse of the U.S. economy during the Great Recession. His second best-seller, Dealing with China, details his career working with scores of China’s top political and business leaders and witnessing the evolution of China’s state-controlled capitalism. The book was chosen by Facebook founder Mark Zuckerberg for the Mark Zuckerberg book club. Paulson has been described as an avid nature lover. He has been a member of The Nature Conservancy for decades and was the organization's board chairman and co-chair of its Asia-Pacific Council. In that capacity, Paulson worked with former President of the People's Republic of China Jiang Zemin to preserve the Tiger Leaping Gorge in Yunnan province. Paulson co-chaired a group called Risky Business that raised awareness of the projected economic impact of climate change. Paulson co-chairs the Aspen Economic Strategy Group with Erskine Bowles. He was the founding Chairman of the Advisory Board of the School of Economics and Management of Tsinghua University in Beijing. Notable among the members of Bush's cabinet, Paulson has said he is a strong believer in the effect of human activity on global warming and advocates immediate action to decrease this effect. During his tenure as CEO of Goldman Sachs, Paulson oversaw the corporate donation of 680,000 acres (2,800 km2) on the forested Chilean side of Tierra del Fuego, bringing criticism from Goldman shareholder groups. He further donated to conservancy causes US$100 million of assets from his wealth, and has pledged his entire fortune for the same purpose upon his death. Paulson was portrayed by William Hurt in the 2011 HBO film Too Big to Fail and by James Cromwell in the 2009 BBC film The Last Days of Lehman Brothers. In the documentary film Inside Job, Paulson is cited as one of the persons responsible for the economic meltdown of 2008 and named in Time as one of the "25 People to Blame for the Financial Crisis". In September 2013, Bloomberg Businessweek released the documentary film Hank: Five Years From the Brink, directed by Oscar-nominated Joe Berlinger and distributed by Netflix. Paulson is featured in the 2018 HBO documentary "Panic: The Untold Story of the Financial Crisis." ^ a b "Home". The Paulson Institute. June 27, 2012. Retrieved 2012-10-27. ^ Battle, Robert (August 23, 2006). "untitled". Ancestries of Miscellaneous "Celebrities". Ancestry.com. Retrieved October 11, 2008. ^ Townley, Alvin (2007). Legacy of Honor: The Values and Influence of America's Eagle Scouts. New York: St. Martin's Press. pp. 178–188, 196. ISBN 0-312-36653-1. Retrieved December 29, 2006. ^ Belser, Alex (May 31, 2006). "Paulson '68 to lead Treasury". The Dartmouth. Hanover, NH. ^ Jackling, Brook (April 20, 2007). "Hank Paulson named graduation speaker". The Dartmouth. Hanover, NH. Retrieved May 14, 2011. ^ Cohan, William D. (May 2011). "Goldman's Alpha War". Vanity Fair. ^ "US faces global funding crisis, warns Merrill Lynch". The Daily Telegraph. London. July 16, 2008. Retrieved May 4, 2010. ^ Steve Gelsi (June 30, 2006). "Paulson files to sell $500 mln of Goldman stock - MarketWatch". MarketWatch. Archived from the original on January 4, 2013. Retrieved October 27, 2012. ^ "President Bush Nominates Henry Paulson as Treasury Secretary", White House, 2006, Retrieved June 29, 2006. ^ "New Treasury head eyes rising inequality", The Christian Science Monitor, August 3, 2006, Retrieved August 3, 2006. ^ Jeanne Sahadi (25 March 2008). "Paulson: Social Security fix needed". CNN Money. Retrieved 11 December 2018. ^ "HOPE NOW Alliance Created to Help Distressed Homeowners" (PDF) (Press release). Hope Now Alliance. October 10, 2007. Archived from the original (PDF) on September 23, 2011. Retrieved September 24, 2008. ^ Yidi, Zhao; Hamlin, Kevin (September 23, 2008). "China Shuns Paulson's Free Market Push as Meltdown Burns U.S." Bloomberg L.P. Retrieved May 2, 2011. ^ Greg Robb (20 April 2007). "Paulson says U.S. housing sector 'at or near bottom'". MarketWatch. Retrieved 11 December 2018. ^ Lawder, David (August 1, 2007). "Paulson sees subprime woes contained". Reuters. Retrieved November 14, 2010. ^ "Remarks by Secretary Henry M. Paulson Jr. on Current Financial and Housing Markets at the US Chamber of Commerce". Treasury.gov. March 26, 2008. Retrieved 2012-10-27. ^ "List Of Troubled Banks Will Grow, Paulson Says". CBS News. July 20, 2008. Archived from the original on December 2, 2008. Retrieved November 14, 2010. ^ Brinsley, John (August 10, 2008). "Paulson Says No Plans to Add Cash to Fannie, Freddie". Bloomsberg Worldwide. Retrieved September 23, 2008. ^ Lockhart, James B., III (September 7, 2008). "Statement of FHFA Director James B. Lockhart". Federal Housing Finance Agency. Archived from the original on September 12, 2008. Retrieved September 23, 2008. ^ "Testimony by Treasury Secretary Henry M. Paulson Jr". Treasury.gov. November 18, 2008. Retrieved 2012-10-27. ^ "Remarks by Secretary Henry M. Paulson Jr. at The Ronald Reagan Presidential Library". Treasury.gov. November 20, 2008. Retrieved 2012-10-27. ^ James B. Stewart (September 21, 2009). "Eight Days – The battle to save the American financial system". The New Yorker. Retrieved November 14, 2010. ^ James B. Stewart and Peter Eavis (September 29, 2014). "Revisiting the Lehman Brothers Bailout That Never Was". The New York Times. Retrieved February 4, 2016. ^ Sorkin, Andrew Ross (2009). Too Big to Fail: The Inside Story of How Wall Street and Washington Fought to Save the Financial System—and Themselves. New York: Viking Press. pp. 350–352. ^ Daniel Gross (September 17, 2008). "The Fundamentals of Our Economy Are Strong". Slate. Retrieved November 14, 2010. ^ Sahadi, Jeanne (September 19, 2008). "Rescue cost: Hundreds of billions". CNN. ^ Fox, Justin (December 17, 2008). 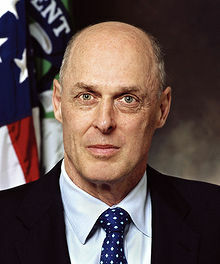 "Runners Up: Henry Paulson". Time. Person of the Year 2008. Retrieved September 15, 2009. ^ Herbert, Bob (September 22, 2008). "A Second Opinion?". The New York Times. Retrieved October 10, 2008. ^ White, Ben (September 19, 2008). "Details of a Rescue Plan Are Unclear, but Some Already Benefit". The New York Times. Retrieved October 10, 2008. ^ Michael Mandel (March 15, 2009). "German and French banks got $36 billion from AIG Bailout". Bloomberg Businessweek. Retrieved November 14, 2010. ^ Dunbar, John (October 25, 2008). "Uses for $700 billion bailout money ever shifting". USA Today. Associated Press. Retrieved November 14, 2010. ^ "SAIS Reports" Archived March 31, 2012, at the Wayback Machine. Paul H. Nitze School of Advanced International Studies. February – March 2010. Retrieved June 27, 2011. ^ McCaskill, Nolan (June 24, 2016). "Former Bush Treasury secretary: 'I'll be voting for Hillary Clinton". Politico. Retrieved June 24, 2016. ^ Paulson, Henry M. (24 June 2016). "When it comes to Trump, a Republican Treasury secretary says: Choose country over part". The Washington Post. Retrieved 26 June 2016. ^ Susan Page (April 13, 2015). "Hank Paulson: Economic challenges, China — and the birds". USA Today. Retrieved April 19, 2015. ^ Richard Feloni (April 16, 2015). "Why Mark Zuckerberg is reading Hank Paulson's new book about China". Business Insider. Retrieved April 19, 2015. ^ Somerville, Glenn (May 30, 2006). "Paulson brings Wall Street luster to Treasury". Yahoo! News. ^ Helm, Burt (January 31, 2015). "Climate change's bottom line". The New York Times. Retrieved July 12, 2015. ^ Heilprin, John (June 2, 2006). "A global warming believer in Bush Cabinet". Associated Press. ^ Troy Patterson (May 23, 2011). "Too Big To Fail". Slate. ^ DealBook (August 19, 2009). "Coming Soon: Lehman Brothers, the Movie". The New York Times. Stewart, James B., "Eight Days: the battle to save the American financial system", The New Yorker, September 21, 2009. Wikimedia Commons has media related to Henry Paulson. "Henry Paulson collected news and commentary". The New York Times.